This monthly notification is an outline of construction activities for the month of April 2019, pending City of Beverly Hills approval. Additional notices detailing these activities will be sent by email through the Purple Line Extension, Section 1 database. Excavation and Hauling at Wilshire Blvd./La Cienega Blvd. and Wilshire Blvd./Gale Dr.
Hauling and excavation will continue at the Wilshire/La Cienega and Wilshire/Gale staging yards. Haul routes are limited to Wilshire Blvd., La Cienega Blvd., major arterials, and interstate highways. 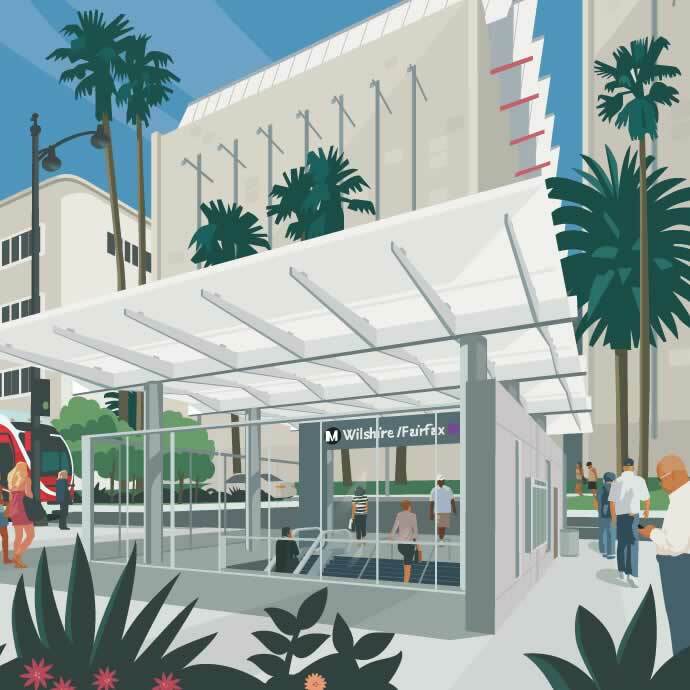 Intermittent sidewalk closures on the north side of Wilshire Blvd. between La Cienega Blvd. and Gale Dr. may be required to accommodate excavation activities. Instrumentation Work at Wilshire Blvd./La Cienega Blvd. Intermittent lane closures and turn restrictions on La Cienega Blvd. and Wilshire Blvd. may be in place during non-rush hour traffic times (9am to 3:30pm, 8pm to 6am Monday to Friday, and 8am to 6pm Saturday and Sunday) for instrumentation work. Intermittent sidewalk closures in the Wilshire/La Cienega area may be required to install monitoring equipment for the underground work. Additional details are provided in individual construction notices. Utility Work and Street Maintenance at Wilshire Blvd./La Cienega Blvd. Intermittent lane closures, turn restrictions, and sidewalk closures on La Cienega Blvd. and Wilshire Blvd. may be in place during non-rush hour traffic times (9am to 3:30pm, 8pm to 6am Monday to Friday, and 8am to 6pm Saturday and Sunday) to support maintenance work and the installation of utility access points. Additional details are provided in individual construction notices. City of Los Angeles work at Wilshire Blvd./Crescent Heights Blvd. A detour will be in place, the route will be eastbound Wilshire Blvd. to southbound San Vicente Blvd. to northbound Fairfax Ave. to eastbound Wilshire Blvd. Left turns at San Vicente and Wilshire will also be maintained. Additional details will be provided in a future Construction Notice. *Work has received necessary permits and approvals or are pending approval by the City of Beverly Hills. Additional construction notices will be distributed with further details prior to the start of major activities.